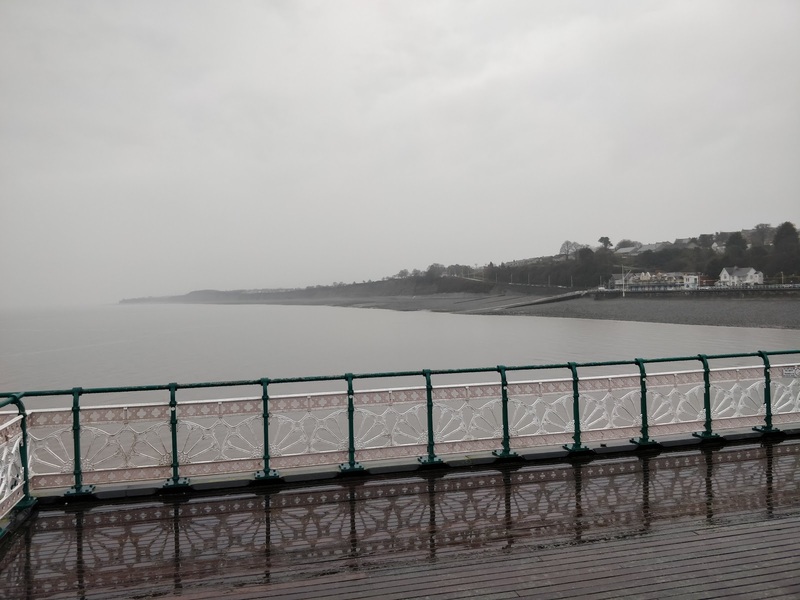 Weather/Conditions: rain, waterlogged, overcast, muddy, local flooding, getting the picture? 2018 had started damp and by the end of March, the ground was extremely waterlogged. The final email from Run Walk Crawl and their Facebook update all recommended trail shoes with lots of grip, even though there are a good few miles on path and road. I had planned to run Manchester marathon over this weekend as I initially wanted to beat my PB and run with a very good friend, but then remembered I hate road racing. Having run the race last year I knew this was not an easy route and as the final race prior to TP100 I wanted to push myself a little, but also enjoy it. Friday night arrived and the forecast changed to show yet more rain, yay! 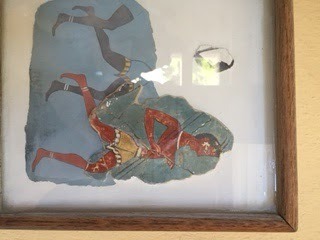 I spent a night in an Airbnb on Bridgend, preparing my kit and my mind for the race. Time to send the Black Dog off and relax. 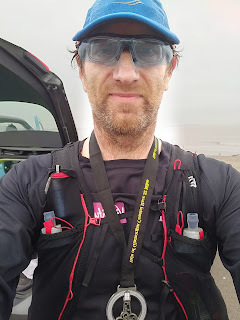 I arrived at the car park in Ogmore-by-sea where the race finishes and the coaches pick you up and take you to the start in Penarth. I sat on the bus and zoned out, using meditation techniques to help me relax. After arrival, we had a quick kit check, down to the pier for a brief and then out to the race start. The rain continued to fall as the horn sounded and we were off! 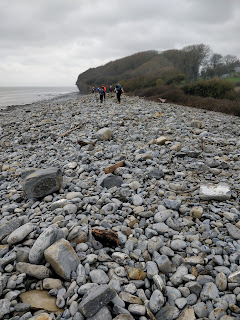 We turned left off the pier and climbed along the coastal road and then picked up the path, already muddy and waterlogged, the hundreds of feet churned the ground even more. 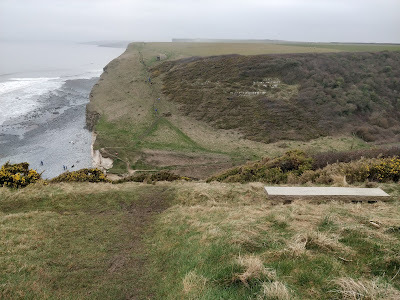 At 2 miles the path turns west, the thin row of bushes and trees barely hiding the cliff edge and giving no protection from the weather. As the route headed through Swanbridge the path winds its way around caravan and holiday home parks, much to the amusement of the Easter holidaymakers. 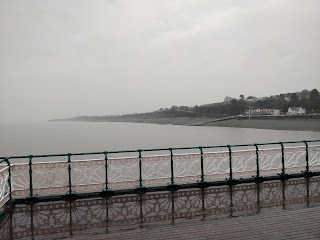 As we approached the outskirts of Barry, at about five and a half miles, we hit one more muddy section and then out onto the road, my trail shoes finding it hard to get much traction on the hard surface. 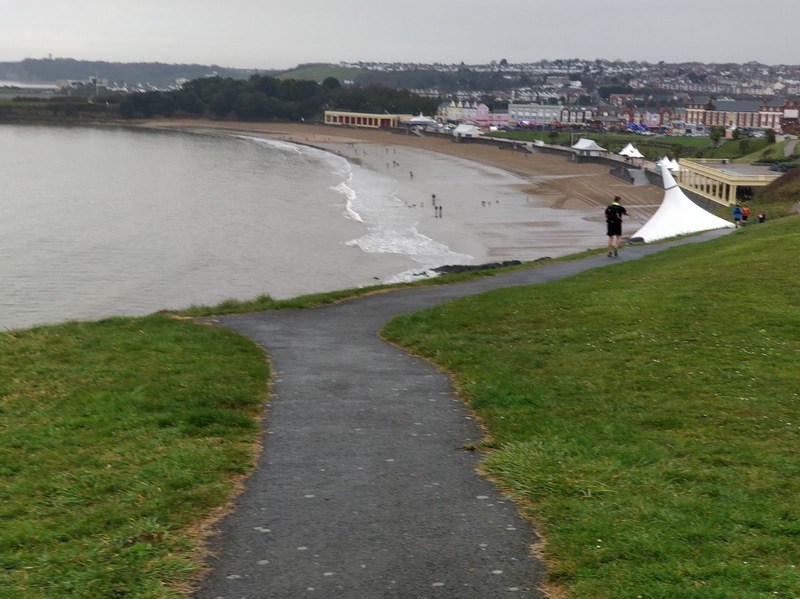 The course loops around the docks and then further on into Barry, where the path became tiled and extremely slippery at times, I crossed the road and found the cycle path a lot easier to run on. Looping right out around the outskirts of Barry Island we passed through the finish of the local Parkrun to cheers and clapping, I knew full well that some of those runners had fought their own battles this morning and thanked them back. 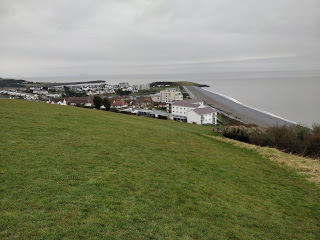 Finally, the sections around Barry were complete, we ran around the harbour towards The Knap and at thirteen miles, through the first checkpoint I actually noticed, and the first real climb was upon us. At this point, I unleashed my secret weapon, I unhooked the Leki poles strapped to my hydration vest and powered up the hill. 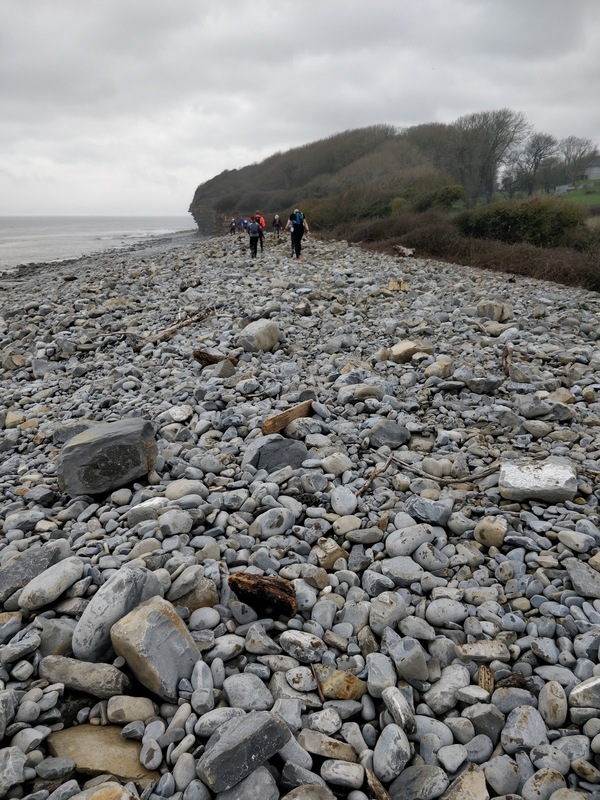 I can remember from last year feeling shattered at this point but my legs were still strong and I pushed on towards Porthkerry. The rain finally stopped. We dropped down through Cliff Wood and then steep steps into Porthkey Park, where the 18 mile runners were due to start, there also a food and water checkpoint where I grabbed two jaffa cakes and kept going. I had arrived ahead of them starting, last year they had already started, and I crossed the rocky beach, climbed the next "hill" at 15 miles and was almost into the next caravan park by the time the whippets passed me. Passing through Rhoose we headed across the beach to flat section of path with a small seawall at 18 miles, this stretched out around the power station. I stopped and took time to strip off the cold and wet tops I was wearing, put on a dry top and stashed my waterproofs and poles. Even after attempting to wring them out, the wet tops doubled the weight of my hydration vest. Hey ho. The path should have enabled us to pick up some pace but it had flooded, very deep in places and so we climbed up on to the narrow seawall and shuffled along. At 20 miles we had passed the Aberthaw B power station and I stopped at the checkpoint for the first of my flat coke for the day. With only around a half marathon to go, now the hard part of the course. The route drops down into many coves and most of them you have to cross a few hundred meters of pebbles, the smallest being fist-sized. The whole process of crossing these sections was made harder by the fact the stones were wet and slippery. But hey, it was fun. One of the many rocky "beaches"
From 21.5 miles the few miles of flat gave way to hills again, all the way to the end. I extracted my running poles again and attacked the first hill. The paths were both as treacherous downhill as it was steep uphill the other side, often with no steps and water running down what was left of the path. Many narrow streams were now swollen to small rivers, the water pouring down off the hills, making the crossings tricky. As we followed the coastal path, at times only a few feet across and wedged between the fields to our left and cliff to our right. 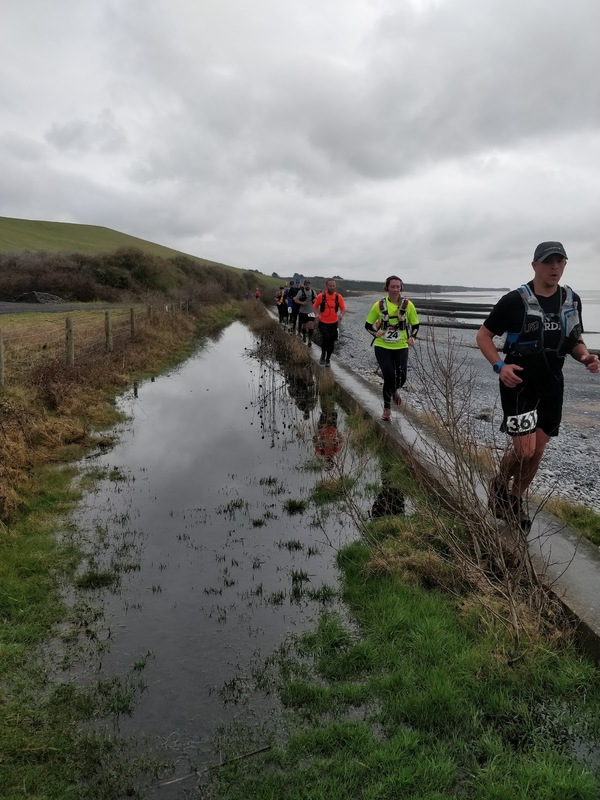 The path was often worn into a deep rut and after weeks of rain ankle high standing water stretched across the path, mixed with mud as hundreds of runners slipped their way through the unplanned obstacles. I used my poles to stabilise me through these sections, allowing me to keep some pace. Dropping down into yet another cove. At Marcross we passed through the grounds of the lighthouse at 27 miles and the route then turned to follow the coast north-west towards Southerndown. I started to notice that I was catching up runners that had passed me earlier, slowly but surely I was picking off runners again. The hours of training and 30-mile runs may well be finally paying off. 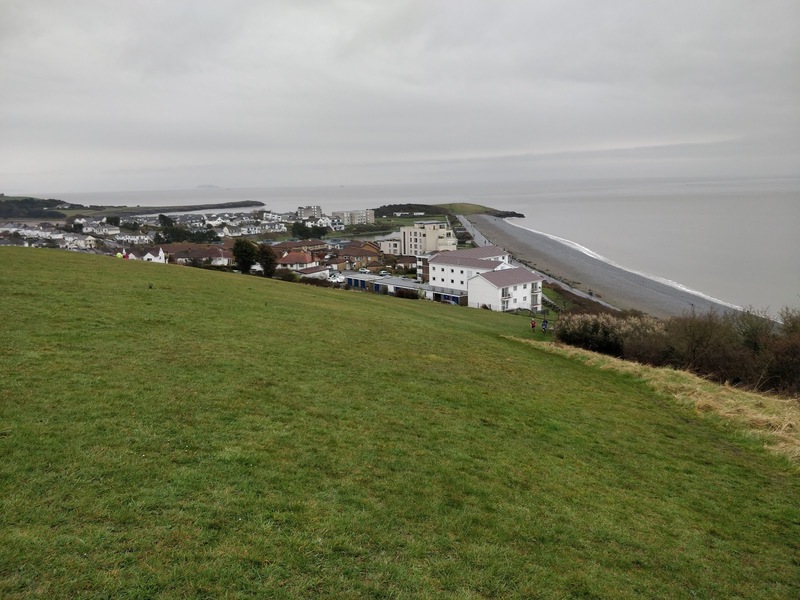 As we dropped down into Dunraven Park, the final cove and last checkpoint, I drank two cups of flat coke and double checked the distance to the finish. With around three miles remaining, I set off again, picking up the pace from somewhere deep and again began to pick off runners yet again, occasionally checking my watch, until I rounded the last corner and saw the finish line. I checked over my shoulder but the nearest runner was a few hundred meters behind, I didn't slow but pushed on even harder. The cheers, cowbells and clapping filled my ears as I finally crossed the line. 33.5 miles, 2,326ft of elevation and 5,903 calories burnt. I had run harder and dug deeper than in any of my previous ultra races, my legs burnt and my core ached. A bottle of water was pushed into my hand and I sat drinking it, my head clearer than its been in years. I smiled to myself, I had not run much faster than 2017 but managed to knock off 25 minutes and in conditions way worse. Then the realisation struck me that the next time I would be lining up to start a race will be in Richmond on 5th May. Saucony Koa ST trail shoes, Dirty Girl gaiters, Drymax Cold Weather Running Socks, ASICS 2-in-1 running shorts, Kalenji cold weather top, Eyepod Sports Sunglasses, Salomon Adv Skin3 12 Set and Leki RCM running poles. Tailwind, 3 Torq gels, salted peanuts, a handful of jelly beans and a few jaffa cakes. If you've never run it before I wholly recommend it. One of the few races I have returned to.